This has always been a controversial illness. It has been recognised medically for only about forty years, but it is still not universally accepted by doctors. There is always the suspicion that it is somehow imaginary, that the sufferers might be frauds. A new name has recently been suggested in the USA and I think this is a good move. 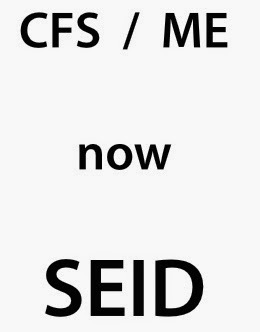 The new name is Systemic Exertion Intolerance Disease - SEID. I have had a clinical I interest in fatigue syndromes for more than twenty years. I just happened to see sufferers, but see them with an open mind as many doctors had not taken them seriously. I listened carefully to their stories (the basis of clinical medicine, as I had been taught) and a pattern seemed to emerge. I ultimately became the consultant lead within Lancashire and south Cumbria in the north-west of England, with a population of 1.5 million. The condition is rare but I gained great experience and saw more than 400 sufferers from CFS as I called it then. I learned from the patients. The patients would report that they felt "tired", "exhausted", or "fatigued", hence the development of the term chronic fatigue syndrome. But normal observers would often say: "But I feel tired / exhausted / fatigued as well, implying that the patients / sufferers were frauds or malingerers, that they were effectively normal but just used a medical escape from work or domestic responsibilities. It is true that normal people can feel tired, exhausted, fatigued. The problem was that the sufferers did not have the language to express what they were experiencing. There was not a suitable non-medical term that could be used - at least in English but I have no information concerning other languages. The pattern is that the muscle and the brain are affected. Heart, liver, kidneys, intestines, blood production and other organs function normally. But the muscle do not. In very severe cases the muscles are not strong enough to support the body sitting in an upright position for more than a a few minutes, with the necessity of lying down, but this would be extremely rare. Usually maintaining a supported sitting posture would be satisfactory, but standing for more than a few minutes would be impossible. Walking for more than a few steps or a short distance would similarly not be possible. If at this point the sufferer would be unable to sit down then collapse would occur. The problem is clearly that of "exertion or exercise intolerance" or "exercise-induced muscle weakness". Once such a term is used, the nature of the illness becomes clear. There is another illness characterised by exercise-induced muscle weakness, and that is myasthenia gravis. It is different and rather more dramatic. Double vision, drooping of the eyelids and slurring of speech are typical. In SEID / CFS / ME brain function is also disturbed. This is a failure of concentration and the recording of memory. Conversation becomes very exhausting. Reading a book is impossible: when the bottom of the page has been reached, what was at the top of the page has been forgotten. Storylines of television or films cannot be followed. We can see the advantage of the new term Systemic Exertion Intolerance Syndrome. "Systemic" implies a wide-spread illness with perhaps more than one body system involved (muscles and brain. Exertion or exercise intolerance is now self-explanatory. The use of the term "Disease" is interesting, but it does give significant medical acceptance of the condition. In general I use the term "disease" to describe an illness in which there is an obvious abnormality of anatomy, the structure of the body. This would include cancers, heart attacks (myocardial infarction), pneumonia and many others that we know. A "disorder" can be viewed as an illness in which part of the body does not function in a normal way but the structure appears to be normal. We use the term functional bowel disorder as an alternative to irritable bowel syndrome. But when we understand the biochemical aspect of a condition, such as a high blood sugar in diabetes, we tend to use the term disease. I have usually viewed SEID / CFS as a "disorder" as the muscle biopsies usually show normal appearances and the pathophysiology, the nature of the abnormal function, is not clear. But with SEID there is some understanding of the nature of the disturbance within the body. This will be the subject of another post shortly.